Rigged, sailed, righted by one person. 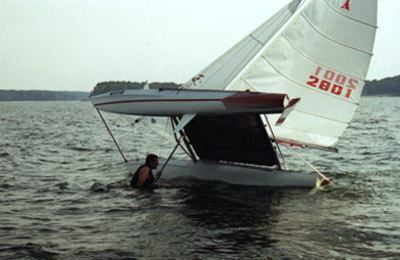 The Isotope and Cheshire are performance catamarans. 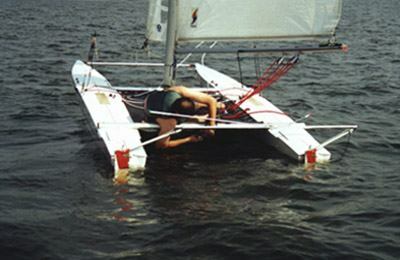 The balanced design makes it possible to fine tune for maximum performance - all of the equipment is there as the sailor's skill level grows. 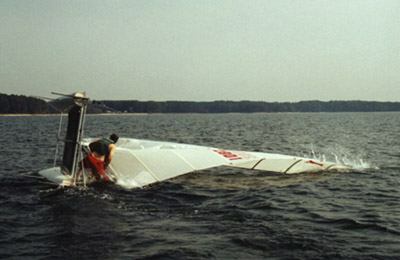 Many safety concerns are addressed with hull flotation	[ ], foam inside the top of the sealed mast, and a righting bar. 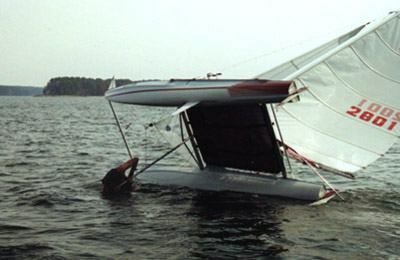 Also available is a removable pocket on the top panel of the mainsail in which a piece of foam flotation can be inserted. Quality. 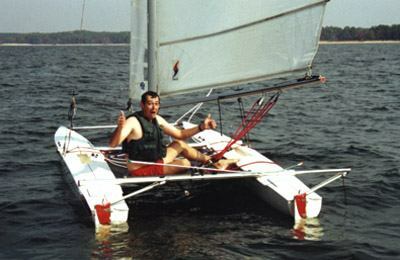 Our two sailing cats, the Isotope and the Cheshire, are built per order so that each boat is what the owner wishes within class specifications. 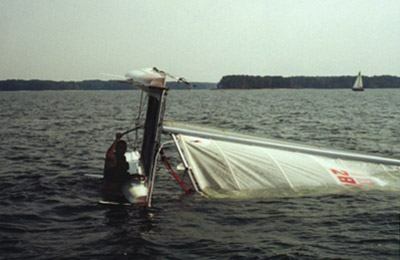 Our crafts are manufactured with reinforced molded fiberglass hulls and equipped with the best marine hardware. 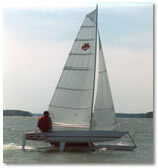 The thoughtful design and workmanship assures the owner's satisfaction and earns the boats the reputation of being the "Smart Cats." 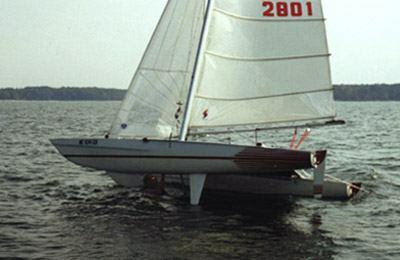 See the Isotope in Action at the 39th US Sailboat Show. Instructions:Click on Free Connection, US Sailboat Show, in the lower left. Use isotopefleet@hotmail.com, password: isotope (lowercase) to login or create you own login. Once you are logged in, select the free connection a second time. Isotope starts at 7:41. 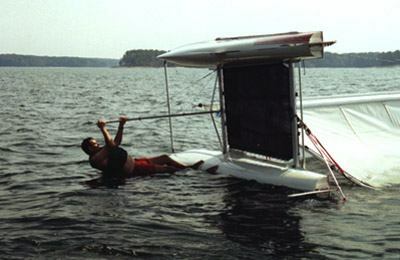 Both the Isotope and the Cheshire have IFG's Righting Bar to enable one person to right the boat while in the water. See the Righting Bar in action - view a 10 image Slide Show as photographed by Bill Setzer at Harbour Lights Studio, Virginia Beach, VA.
IFG's Telescoping Tiller with Tiller Return is available for purchase. 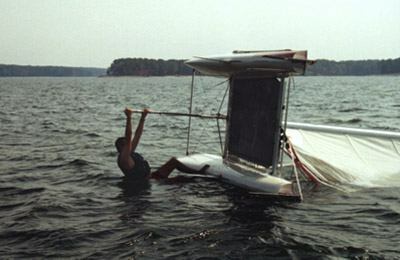 Each year the Carolina Sailing Club (CSC) sponsors the North Carolina Governor's Cup Regatta at Kerr Lake, one of the largest and oldest inland-water regattas in the United States. 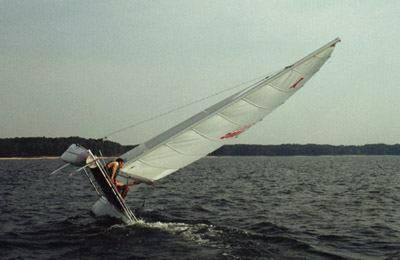 The Isotope class has won the race many times - twice with IFG owner Frank Meldau at the tiller. 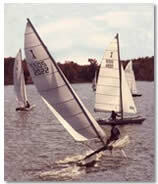 Go to CSC for an events calendar and regatta reports.